It’s ice cream week here at HonestlyYUM, and I think I may have found my calling. I traded in my bar tools (sob) for a good old fashioned soda fountain cap. At least, so I like to pretend. Got that image? Good. Now picture this: you’re wandering the street market in Bankok, and while passersby are lining up for their Thai iced teas, you’re cooling off with one of these bad boys. Don’t get me wrong, I love me a traditional Thai iced tea. It’s just that, well . . . this is better. Okay, maybe all this sugar is getting to my head. But seriously, what’s not to love? Silky, sweet condensed milk ice cream slowly melting its way down into an ice-cold and slightly bubbly bath of Thai tea. Yep, things just got real. 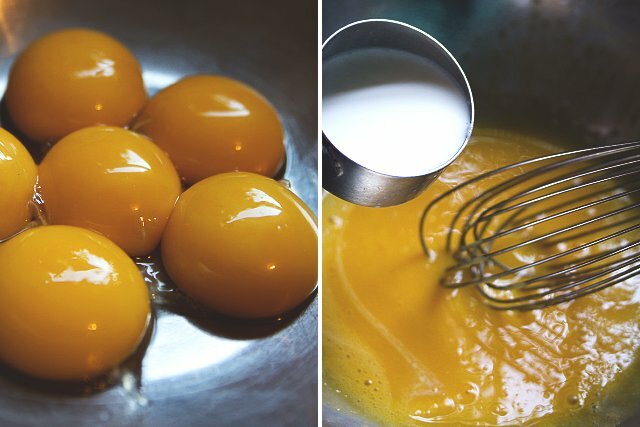 In a small bowl, whisk the egg yolks and set aside. Meanwhile, in a saucepan over medium heat, warm the half and half just to a simmer. 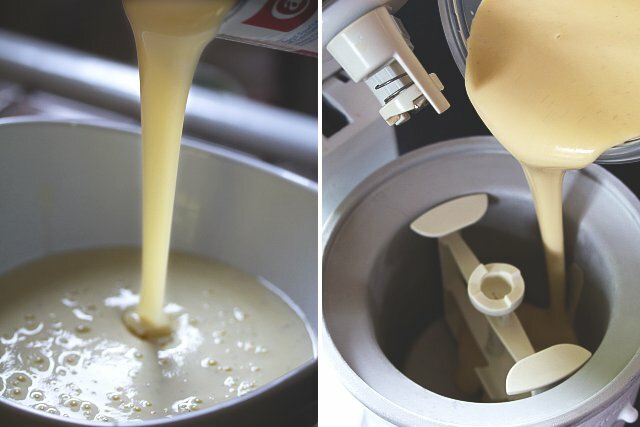 Temper the eggs by slowly adding 1/2 cup of the warm cream, whisking constantly. Pour the tempered egg mixture back into the warm cream. 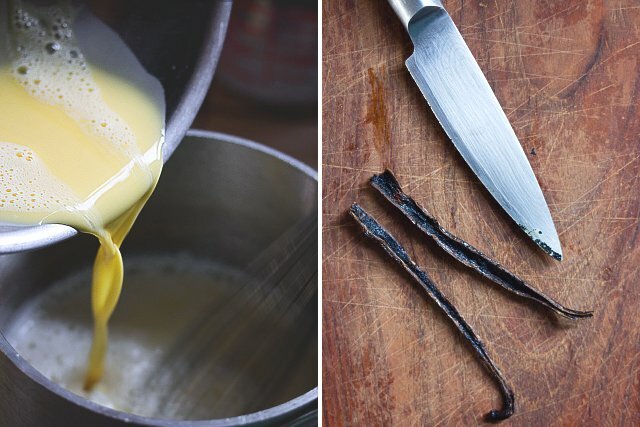 Split the vanilla bean and scrape the seeds into the mixture, along with the vanilla extract. Carefully cook over medium heat, stirring constantly, until it is thickened and coats the back of a spatula. Strain into a container and add the condensed milk. Stir to combine. Let cool to room temperature, then cover and refrigerate at least 3 hours or overnight. Once chilled, it's time to churn your ice cream. Follow the instructions on your ice cream maker to do so. Transfer ice cream into storage container and freeze until firm. Brew a cup (8 oz) of Thai tea. Instructions may vary based on the brand you use. This is where you should add the sugar for a sweeter tea. Remember, this will be extra sweet once the ice cream melts into the float, so only add if you have a serious sweet tooth. Let tea cool to room temperature and then refrigerate until well-chilled. 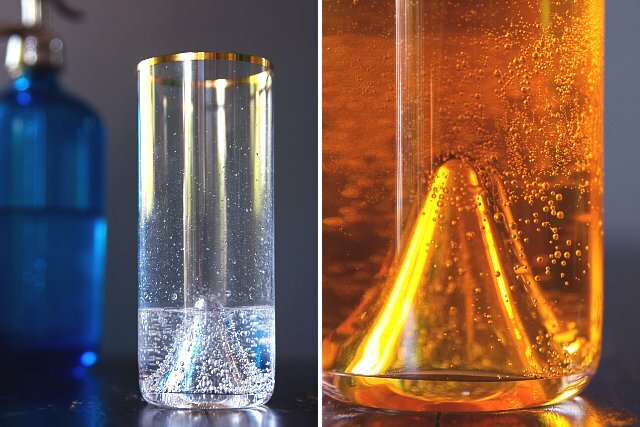 Add cold soda water and tea to your glass. Carefully drop in two scoops of the condensed milk ice cream. Either allow the ice cream to slowly incorporate on its own as you sip the tea, or mix it up right away for a sweet creamy treat. What brand of Thai tea do you use? I’m having a hard time finding a good brand. Especially one without dye. I love this—–the photo is pulling me in. I am helpless——-. Refreshing and rich at the same time without being cloying. Awesome. Todd this is awesome! I know this post is a year old at this point but saw it on a roundup and had to come over and pin it! Love the overflowing cup, the styling is just great! Thank you so much Averie!! I actually was just sorting through my teas and found that box of Thai tea. I think it’s time for a float!! 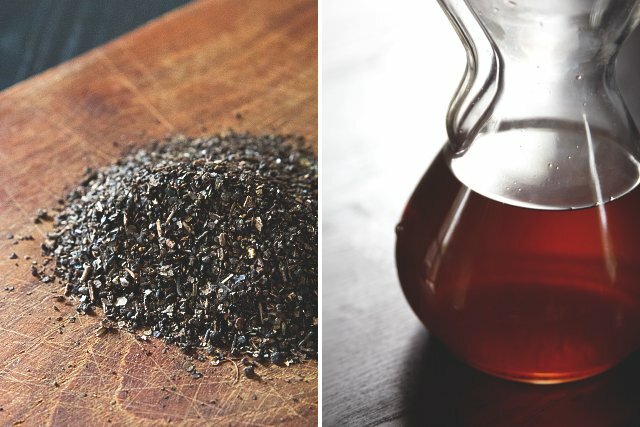 I’ve never tried Thai iced tea before, but after looking at these photos, I have to try it soon! Looks spectacular! Condensed milk ice cream? How can I never have seen this before in my life. As a little kid in Brazil they sell these little packets of condensed milk that you basically just eat like go-gurt and I LOVED those things. So needless to say combining this with ice cream is genius. I LOVE Thai iced tea. Turning it into a float just blew my mind. My mouth is watering!! So yummy! This looks amazing!!! Great pictures!! WOW, this looks absolutely amazing! 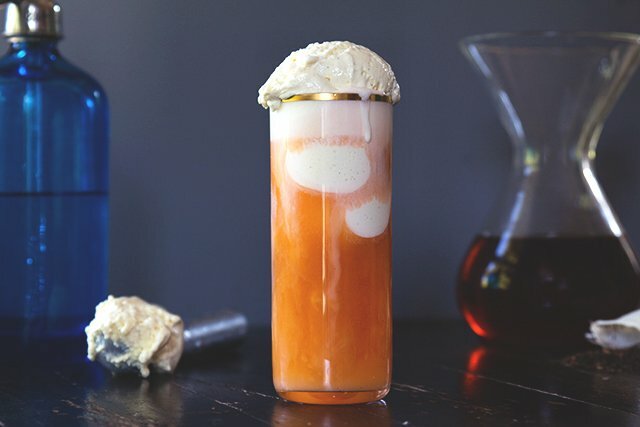 I can’t believe how I can take one look at something and crave it so badly, but that’s precisely what’s happened with this lovely iced tea float. Great idea! 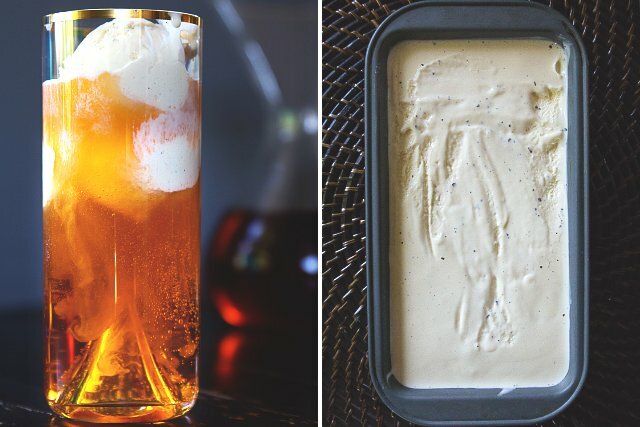 So I love tea dearly, and I also love ice cream – what a genius idea on mixing these together. The pictures look great, yum! Bringing together two of my favorite drinks without losing the distinct quality of both! Tasty, tasty. Wow. This looks mouthwateringly delicious! Cannot wait to try. Stellar job as always! You just killed me. It looks a-MAZING!! Great job!! This looks absolutely amazing. 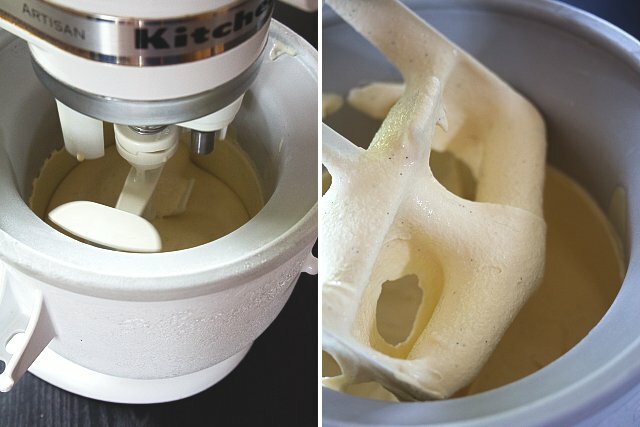 I’m going to have to buy the kitchenaid ice cream attachment just to make this! Great recipe! But how do you make brewed Thai Iced tea?! 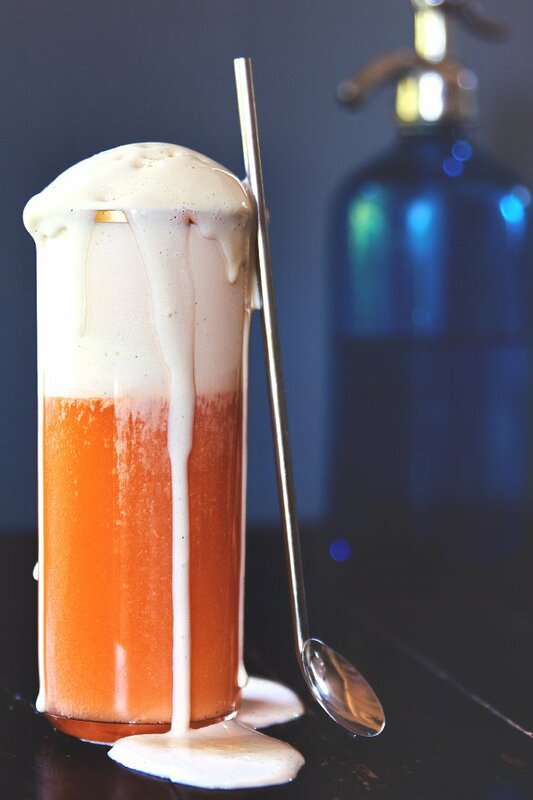 Thai tea is a blend of black tea, star anise, cinnamon, vanilla, orange flower water, and tamarind. Luckily, they sell pre-made thai tea blends. Brew it like you would a normal cup of tea, steeping either loose leaf or a tea bag in hot water. The photography alone from the bloggers at Honestlyyum is worth visiting this site. And then…the food and drink recipes, DIY ideas, gadgets…you guys simply hit it out of the park. Very nicely done folks. Not sure that Ive ever had Thai ice team but I do love icecream floats! I may hav to try this soon. Oh Wow! Now this is THE way to drink iced tea! So love this! The condensed ice cream just sounds and looks so scrumdiliumptious! 149 Cool Treats to Help Beat the Summer Heat – Frugal Mom Eh!